How do herniated discs occur and what are the best treatment options? Low back pain affects over 80% of the population at some point in their lives and it’s the second most popular reason for visiting the GP after the common cold. It comes in many guises but a herniated or ‘slipped’ disc is one of the easiest things to succumb to and is one of the most difficult types of back pain to relieve. This article examines the ways in which herniated discs can occur and explains the treatment options available to help patients get back to their usual daily activities. Contrary to popular belief, slipped discs are not just common to people who do manual work involving heavy lifting: many office-based workers succumb to disc problems as a result of sitting in one position for too long, putting pressure on the disc walls so that they weaken over time. The spine is made up of 24 individual bones called vertebrae which are stacked on top of each . Discs are the protective circular pads of connective tissue in between – the ‘padding’ which acts as shock absorbers, protecting the spine when we run or jump. We cause small weaknesses in our spine all day long with prolonged sitting or standing in certain positions, for example at workstations or hunched over the ironing board. The intervertebral discs are unlike other parts of the body in the sense that they have a limited nerve supply. Very often we are not aware of the discs being under strain until the accumulation of months or years of stress has reached a point where small tears form in the outer disc wall. These tears can result in several months of nagging discomfort. As a defence-mechanism against further damage, the body will often react to this situation with muscle spasm or at the very least, ‘muscle guarding’ which is when the long muscles of the spine tighten up. This causes compression of the discs and a lack of mobility in the spine. If this situation prevails, the tears can very often become worse and allow the inner jelly like part of the disc – the nucleus – to herniate outwards. This is referred to as a herniated, bulging or ‘slipped’ disc. Disc problems can also cause pain in other areas of the body, the most common of which is sciatica, a grinding pain which travels down the length of the leg. Sciatica can be caused by the bulging part of the disc squashes the nerve root next to the disc or when chemicals from a prolapsed disc irritate the nerve endings. Neck pain, headaches or numbness in the foot can also be a sign of a damaged disc. So, what are your options for treatment? Your first port of call should always be a good osteopath, physiotherapist or chiropractor who will have experience in treating disc-related problems. With this type of manual therapy in most cases you should see a marked improvement in your condition in 6-8 weeks. At the same time, if you are in so much pain that you can’t sleep then your GP can prescribe you painkillers and/or anti-inflammatory medicines which can be taken alongside physical treatment. 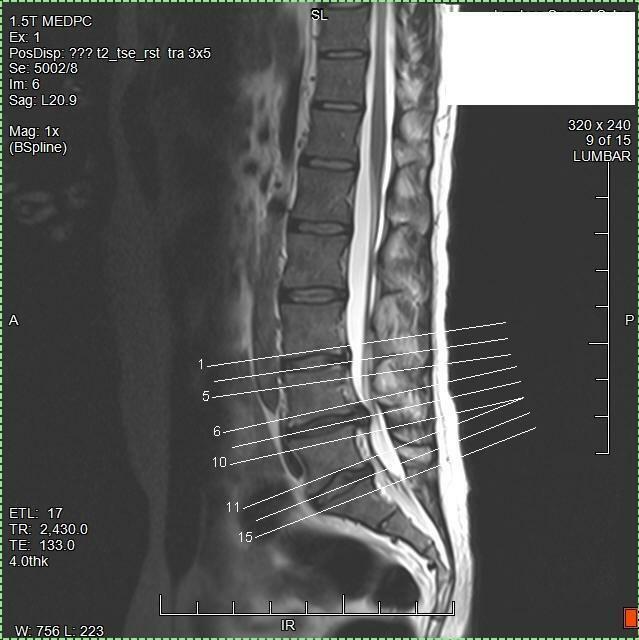 If you see no real sign of improvement after eight weeks of manual therapy, it would be advisable to get an MRI scan of your spine to confirm the possible causes of your pain and the location (level) of the spine affected. If a disc problem is identified, a programme of treatment including IDD Therapy non-surgical spinal decompression may be recommended. IDD Therapy is a computer-controlled mechanical treatment used by clinicians to gently and safely relieve pressure on specific discs, alleviate muscle spasm and increase mobility in the spine. As part of the IDD Therapy programme, patients undergo a course of core-strengthening exercise to help them maintain their healthy spine. In a small number of cases, patients with severe disc damage/degeneration may require invasive treatments including injections and/or surgery. Also, in rare circumstances, the patient may require immediate surgery, for example, when the bowel and bladder function is affected. There are different types of surgery for a herniated disc, the most common is the microdiscectomy where fragments of the disc may be cut away. Another common type of spinal surgery is the lumbar fusion where the vertebrae surrounding a disc are fused together. Thus, there are now several treatment options available to patients with herniated discs and indeed, a wider array of effective non-surgical options allowing more patients to avoid invasive procedures. For information about treatment options at Spine Plus or any other IDD Therapy providers, please use the form below. Spine Plus is a group of multidisciplinary clinics in London and Essex.